Movie review of the Fantastic Four movie, starring Ioan Gruffudd, Jessica Alba, Michael Chiklis, Chris Evans, Julian McMahon —  read to find out what was good, what was bad, and what was downright ugly. Casting — the casting was spot-on; All of the lead actors are very good, and give good performances. Especially Michael Chiklis as Ben Grimm, aka. the Thing. It’s amazing how well he was able to project emotional depth while wearing his heavy “Thing” costume. He brought pathos to a role that a lesser actor would have made comical. Special effects — amazingly well done. When Johnny Storm “flames on” it’s incredibly realistic. It’s the way you would expect a flaming man to look. Likewise, when Reed Richards/Mr. Fantastic stretches, it’s as though the Stan Lee/Jack Kirby comic pages have come to life. The pathos of Ben Grimm — in addition to the excellent acting job by Michael Chiklis, the writers did the original story one better, by having Ben Grimm being engaged to “Debbie”. A young lady that he’s truly in love with. Who breaks off their engagement after his disfigurement. Reed Richards/Mr. Fantastic (Ioan Gruffudd) —  I have no complaints about the actor playing the part, although he’s probably a little young for the role, so the writers came up with the silly idea of having him “mutate” with grey hair at his temples. The character, however, is written totally wrong. He’s a financial failure, even though he’s supposed to be one of the leading minds of the 21st Century. He’s not a natural leader, but seems to be someone who allows himself to be run over by stronger characters, notably Victor von Doom and Susan Storm. TV series. Unfortunately, the writers/producers of Fantastic Four seem unaware of this fact, and contrive scenes to show her off in her underwear, or have her keep her protective suit (made of the classic “unstable molecules”) unzipped down to her navel to show off her cleavage. Likewise, the reason given that she broke up with Reed Richards is that she wanted to take their relationship to ‘the next level” by moving in with him. Why did Reed Richards not take her up on this? Because, Brainiac that he is, he knows that the vast majority of people who live together before marriage never actually get married. The “real” Sue Storm actually has too much self-respect to treat herself like this. Victor von Doom (Julian McMahon) — first, the actor did an excellent job of portraying the vainglorious Von Doom. Many people complain that the origin of Dr. Doom was so drastically different from the comics, and there’s some truth to this. in the comics, Victor von Doom has a tragic childhood, losing both of his parents, with his father saving Victor at the cost of his own life, causing Victor’s bitterness and motivation to attempt to gain control. In the movie, what’s the motivation of multi-billionaire von Doom? “I’ve always been attracted to power.” That’s it. Surely, that’s enough reason to become a callous murderer, isn’t it? Alicia Masters (Kerry Washington) — the blind sculptress who falls in love with the deformed Ben Grimm, in the comics was a redheaded Caucasian woman, and in the film is African-American. I actually don’t have a problem with that, since it really doesn’t matter as far as the movie goes. One thing that does matter is the line that she gives when she meets Ben Grimm for the first time and replies to his line about how God must hate him with “She’s not into hating.” it’s a politically-correct “inclusive” line that pulled me out of the movie, and reminded me about how opposed to traditional American values that Hollywood has become — all for no reason. It happens several times in the movie (i.e. capitalism is evil, “God” is whatever we want Him/her/it/them/etc. to be, etc.) and destroys the carefully-built suspension of disbelief. The reason for the trip into space — in the original comic story, there was a grand reason for the trip into space. the four were attempting the first interstellar travel. Here, there’s a “cosmic storm” coming toward Earth, that Reed hypothesizes has to do with the evolution of life on Earth, and he wants to observe it from von Doom’s orbiting space station. So, why do they need to be there first hand? What can they realistically expect to learn by being there that couldn’t be learned from various recordings? It seems a much smaller vision, and that “grasping for lesser” feeling permeates the film. Marvel Comics’ first family of superherodom, the Fantastic Four, hits the big screen in a light-hearted and funny adventure. It begins when down-on-his-luck genius Reed Richards (Ioan Gruffudd, Horatio Hornblower) has to enlist the financial and intellectual help from former schoolmate and rival Victor Von Doom (Julian McMahon, Nip/Tuck) in order to pursue outer-space research into human DNA. 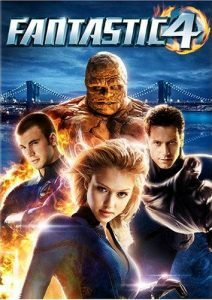 Also on the trip are Reed’s best friend, Ben Grimm (Michael Chiklis, The Shield); his former lover, Sue Storm (Jessica Alba, Dark Angel, Sin City), who’s now Doom’s employee and love interest; and her hotshot-pilot brother, Johnny Storm (Chris Evans, Cellular). Things don’t go as planned, of course, and the quartet becomes blessed — or is it cursed? — with superhuman powers: flexibility, brute strength, invisibility and projecting force fields, and bursting into flame. Meanwhile, Doom himself is undergoing a transformation.